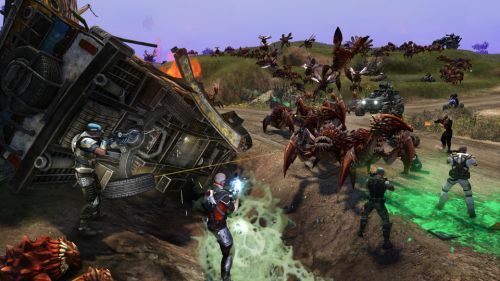 We're heading straight towards the release of Defiance, a unique blend of MMO and shooter set to hit the Xbox 360, PlayStation 3 and PC. The game also blends mediums - with a TV show launching on SyFy set in the same universe - we're told to expect events to branch both the game world and TV world. Here's a trailer for the TV Show premiering April 15th. Today we're happy to be giving away access to the Defiance beta - we have a ton of keys to giveaway and your chance of getting one is pretty dang good. We have 500 keys to give away for the PC version of the game and 10 keys to giveaway on both the Xbox 360 and PlayStation 3. If you'd like a key for the PC version click the enter contest button below and enter the relevant info. We'll pass along your email address used to Trion to be emailed a key on Thursday, March 14th. The first 500 entries will be accepted and we'll turn off entries once we hit the cap. If you're trying for an Xbox 360 or PlayStation 3 key - please leave a comment below and tell us which one you'd like. We'll randomly draw 10 winners for each platform on March 14th. Page created in 0.5851 seconds.